DogBackgrounds Toolbar is a browser plugin from the Mindspark Interactive Network, Inc. family. It should enable users to access a collection of dog photos and, most probably, use those pictures as homepage backgrounds. Many people who install this program on their computers get slightly disappointed because they find a toolbar with buttons leading to third-party websites containing pictures. These websites can be accessed without having DogBackgrounds Toolbar installed on the system too. Also, what many people do not know before installing this software is that their homepages, search tools, and New Tab pages will be changed. 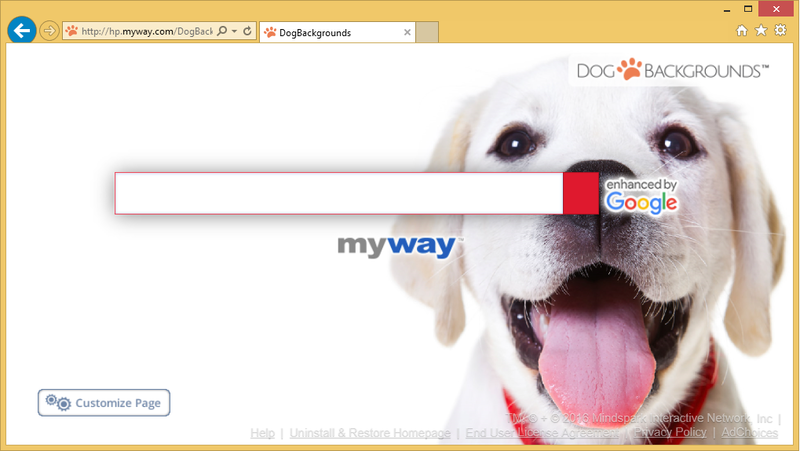 DogBackgrounds Toolbar sets its own website with the MyWay search tool in the middle. It will be seen no matter which browser you use. If you find this annoying, or wish to restore your preferred website, you should go to uninstall DogBackgrounds Toolbar from your computer. Only after doing that you could set a new homepage, default search engine, and the New Tab page. Also, you will lower the chances of experiencing security problems by getting rid of it. What does DogBackgrounds Toolbar do? If DogBackgrounds Toolbar is installed on the computer (no matter it is downloaded from its official website or another source), it affects Internet Explorer, Google Chrome, and Mozilla Firefox. You should see a toolbar at the top after installing it and a new website set. Even though this website does not look harmful, you should not go to use the search box you see on this page because you might be provided with untrustworthy search results having a potential of taking you to bad third-party websites. Since anything, even malware, might be found on these pages, it is better to stay away from the search box you see. Of course, it is not the only defect of DogBackgrounds Toolbar. Like all other Mindspark products, this one might also record personal information about users. If you let it do that, this information might be sold to bad people one day. We are sure you do not wish to experience problems associated with your privacy, so we suggest that you go to delete DogBackgrounds Toolbar right now. Why do I have DogBackgrounds Toolbar on my computer? There are two ways DogBackgrounds Toolbar could have entered your system. First, this browser plugin could have entered your PC in a software bundle with freeware (it is true if you cannot remember downloading it) or you have downloaded it yourself willingly from its official website. No matter what its infiltration story is, you should go to remove DogBackgrounds Toolbar from your computer because it is not a trustworthy program. How can I delete DogBackgrounds Toolbar? As you know, DogBackgrounds Toolbar affects all browsers, so it will take some time to eliminate it fully from the computer. Specialists suggest first trying to reset browsers to remove DogBackgrounds Toolbar; however, if you wish to implement the DogBackgrounds Toolbar removal quicker, you should use an automatic tool. It will implement the DogBackgrounds Toolbar removal for you quickly, and you will not need to do anything yourself, except to launch the scanner.